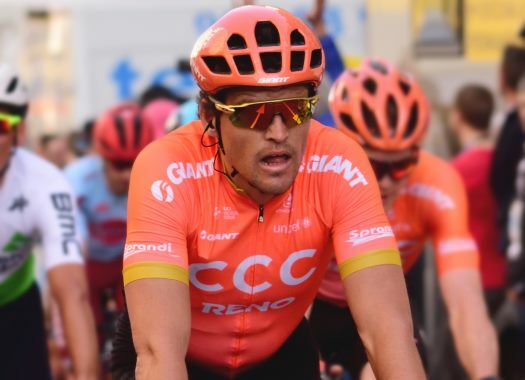 CCC Team's Greg Van Avermaet has taken not only his first ever victory at the Volta a la Comunitat Valenciana but also the first of his 2019 season. The rider was the strongest at the uphill finish and beat Matteo Trentin and Luis Leon Sanchez. Van Avermaet launched a strong sprint in the last metres of the third stage of the Tour of Valencia and raised his arms for the first time in the season. "I am really happy to take this win and it's actually my first individual win here after winning the team time trial in 2017 and 2018," the Belgian commented. "It's always great to start the season with a win and especially on a hard parcours like this with everyone on the limit. "I felt really strong today though and the team did a really good job all day but especially on the final climbs. In the end, I was in a good position on the last switchback, I was positioned perfectly, so I started my sprint hoping that nobody would come around me. It's really good to start the season like this." Van Avermaet was beforehand one of the favourites for this stage. "I felt good but I was keeping an eye on Valverde as he is one of the strongest on an uphill finish like this plus there were also some good sprinters still there," he said. "I think the fact that I'm a little bit of better climber than them played on my side. There were some attacks at the end, but the team rode really well and it was nice to see four of my teammates up there with me in the final. I just had to finish it off." Despite having one teammate less due to the withdraw of Michael Schär the day before, the Olympic champion received a great help of the other CCC riders which helped him take the victory of the stage. "We worked really well together at the start and we all survived the second to last climb," the rider explained. "Then, I asked Guillaume to put me into a good position at the bottom of the final one. He did a perfect job and was even able to go a few kilometres further into the climb for me. I was quite surprised that we still had four guys from our team there. "De Marchi did a really good job to set a hard pace and Wisniowski and Antunes were still there too and that was really important. A lot of us here are still new to one another but it was great to see the guys working for me as well as they did today. It was all about position in the final corners and the guys made sure I was in the right place. To deliver a win with these guys is special as it's not easy especially with the field we have here."